Blessed Joan of Portugal (6 February 1452 – 12 May 1490; Portuguese: Santa Joana Princesa, Portuguese pronunciation: [ˈsɐ̃tɐ ʒuˈɐnɐ pɾĩˈsezɐ]) was a Portuguese saint, Regent and princess of the House of Aviz, daughter of King Afonso V of Portugal and his first wife Isabella of Coimbra. Joanna was the second child of Afonso, but after the early death of her older brother John she was recognized as heir presumptive and given the title of Princess of Portugal. Other children of the king were infantes. 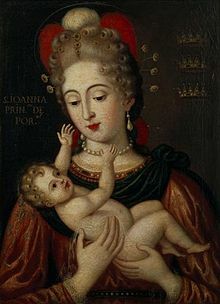 Upon the birth of her younger brother, the future John II of Portugal, she ceased to be heir presumptive, but among the people she continued to be known as Princess Joan. From a young age, Joan expressed a desire to become a nun; however, as she was second-in-line to the throne, her father did not allow it. During his military expedition to Tangier in 1471, Joan served as Regent of the Portuguese Kingdom. After vehemently refusing several proposals of marriage, Joan joined the Dominican Convent of Jesus in Aveiro in 1475. Her brother had, by then, been given an heir, so the family line was no longer in danger of extinction. Still, she was compelled several times to leave the convent and return to the court. She turned down an offer of marriage from Charles VIII of France, 18 years her junior. In 1485, she received another offer, from the recently widowed Richard III of England, who was only 8 months younger. This was to be part of a double marital alliance, with his niece Elizabeth of York marrying her cousin, the future Manuel I. However, his death in battle, of which Joan allegedly had a prophetic dream, halted these plans. She continued to be a great supporter of her brother, John II of Portugal, throughout his reign and her life. Joan died on 12 May 1490 in Aveiro and was buried in the Convent of Jesus in Aveiro. She was beatified in 1693 by Pope Innocent XII. Although she has not been canonized, in Portugal she is known as the Princess Saint Joan. In the early 18th century, the Portuguese nobility, clergy, and court had a revival in interest in the princess. During this time, the Portuguese artist Manuel Ferreira e Sousa was the most famous artist in this revival. He was contracted by various religious institutions, noblemen, and even the royal family to paint scenes from her life. Manuel Ferreira e Sousa's paintings of Princess Saint Joan of Portugal were highly contracted from the 1720s to the 1740s. What's the good word on Joanna, Princess of Portugal?